And we’re back! This is the final installment from The Branding & Design For Bloggers Panel that Sabrina of The Tomato Tart and I had the most enjoyable time hosting during the 2001 Foodbuzz Festival. If you haven’t already, please check out part one, part two and part three. They are all equally thrilling, informative and will get those wheels turning for the re-branding or re-design of your blog. 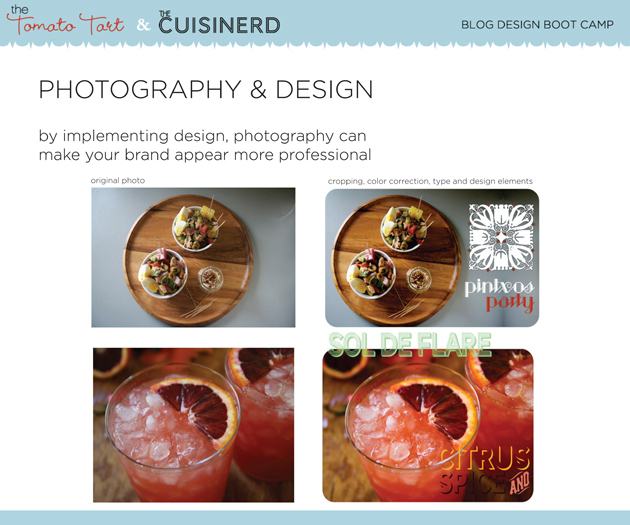 In this last installment we will go over some easy design tricks and how alt photography can help to communicate your brand with a unique twist. We will also have a list of resources for those beginners out there who might be a little timid dipping a toe into the design pool. It is super important to take that additional time to edit your photos, color correct them, and possibly even add graphics. These extra steps, if you choose to tackle, will give your images a more professional and editorial flair. Below is a little side-by-side action to get you thinking about how small enhancements can change a digital photo into something more dynamic. What little extra detail can you give your posts to make it shine a little brighter? Will you add graphics? Will you arrange images in a grid or possibly make them as large as the posting page allows? Think back to part three and the websites we thought were successful and why. There are no rules here… other than you must ENJOY the process! It should never feel like a task when putting love into your blog. The moment typography sends you over the ledge it’s time to sit back and make sure this extra flare is on your master checklist of what you want to accomplish and communicates correctly with your brand. We don’t want to lose sight of what we’re really trying to accomplish: solid branding, communicated with solid, high quality content. Onward!! Don’t have a fancy DLSR? 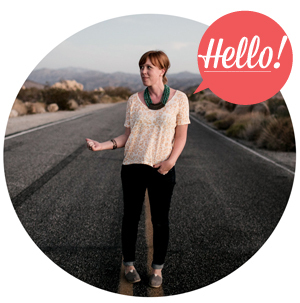 Want to add a little character to your photos? There is another way to stylize photos without using typography and graphics: Hello lo-tech photography! Some love it, some refuse to use it..I personally adore it. In fact, I had the pleasure to see Matt Armendariz (Matt Bites) speak at the International Food Blogger Convention last month and he even admitted his love for Instagram. He shared a story about how smart phone images snapped during a recent photo shoot have been selected by magazine editors and placed into publication instead of his high-res digital shots! A perfect example that lo-tech photography can successfully tell a specific, stylized story and in turn, will successfully communicate your brand’s personality or voice through visuals. There is an overwhelming selection of photo apps out there. All can help achieve a very unique and distinguishable look, it just depends which interface you feel most comfortable with and which achieves the look you’re going for. With most apps available for free or only 99 cents, there is no excuse to start experimenting with this quirky art form! Even if you only post on Twitter or Facebook and not on your blog. Above is a quick example comparing digital photography with smart phone lo-tech images. Notice how implementing different filters can shift an image and create extreme contrasting and overblown colors? What an interesting and different way to visually express the tone or voice of your brand! Instagram: One word: Addictive. I love this app more than anything… It’s my go-to shutter on the fly. Multiple filter types, built in tilt shifting, the option to turn camera borders on or off, and effortless instant posting to Facebook & Twitter! I also love the ability to monitor your friend’s photos in one easy stream and the ease of discovering other amazing photos through your friends’ likes. Okay…I might actually love this app too much and there are days when I know I take way too many photos with it. I will not apologize! It is magic. 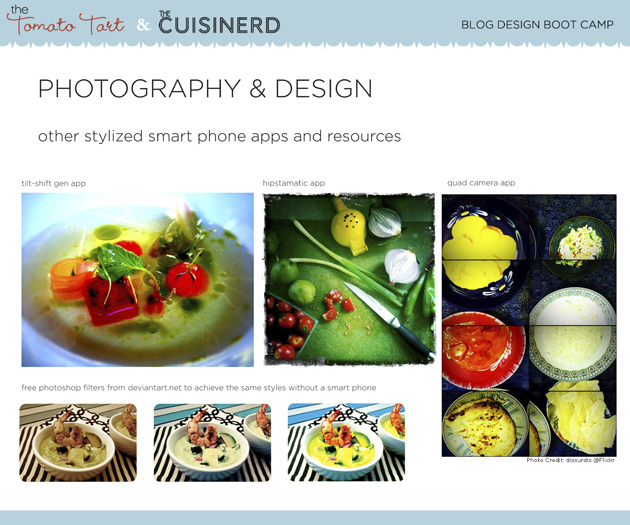 Hey, If you are up and running too, come share your photos with me @TheCuisinerd!! I can’t wait to see them. Tilt-Shift Gen: Forced perspective at its best. This app can make anything look miniature…all kinds of fun. Quad Camera: With the ability to customize how many photos to collage together and an adjustable timer to give you more control of setting up the next shot, this camera app is all about spontaneity and will provide you with some very off the cuff and energetic photos. Toy Camera: This is a cute non-threatening photo app suited for anyone. Several style options and a random mode which will shuffle filters with each shot… Providing you with countless happy accidents! FilterStorm: For the more advanced smart phone photographer. So many options, such a great range of tools, and you can really get into some serious detail using the customization panels. Crisp, beautiful…the depth that can be accomplished is gorgeous. People will not believe you took your photos using a phone. Definitely worth the $3.99! There are several easy to follow tutorials online which guide you step by step to achieve the same antique and vintage colored photos within Photoshop. There are also free downloadable Photoshop action scripts which do all the work for you! One of the best resources out there is DeviantArt, just search for “Instagram Actions” and the latest forum posts will lead you straight to a download link of your choice. There is also a great free download available here which I used to treat the bottom row of digital photos above. But are you really in love with those vintage camera boarders that only the apps can provide? Fret not…You can also purchase more advanced Photoshop filters and templates online here or start using the ol’ Google to search for other Photoshop filters. Tons out there, more and more added every day. It all depends on the kind of look you want to achieve and which method you’re most comfortable with! Pugly Pixel: 110% the cutest, almost too adorable web graphic resource destination. All sorts of offerings including free downloads, tutorials, low cost monthly design subscriptions (for only $5) and full-themed graphic kits which include items such as banners, shapes and photo templates. 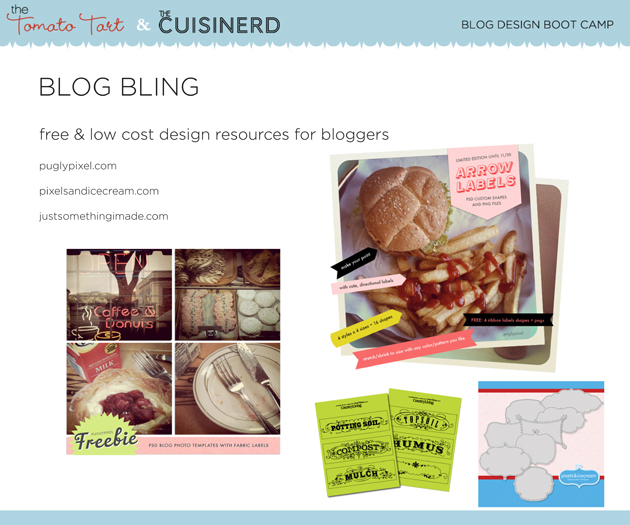 This is your one stop shop for precious, on trend graphic resources. Endless offerings of tips and inspiration. GO. Pixels And Ice Cream: An assortment of free and low cost Photoshop brushes, vector illustrations and embellishments. Definitely worth checking out and browsing, new items added all the time. Just Something I Made: This site has a whole section devoted to freebies! Another great resource with graphics that are a little more vintage and country inspired. Remember what your brand objective, color palette and voice is before getting crazy and dressing up your website with graphics that are not in tune with what you’ve set to accomplish. Focused design for focused branding. 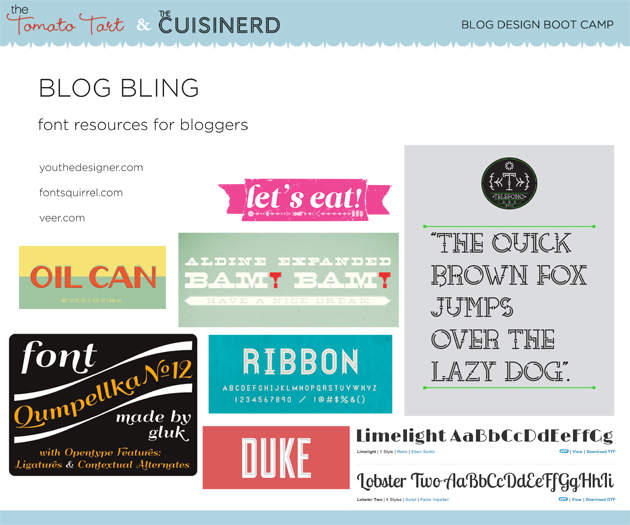 Typography is another easy way to add a little extra oomph to your posts and website. Especially if you’re looking to develop a word mark or logo for your brand, these resources will kick-start inspiration and get you ready to try out some new and different looks. You The Designer: Free! Free! Free! High quality fonts, brushes and vector graphics in a variety of styles that will make any brand look smooth. Font Squirrel: Another free site which hand-picks the best free fonts on the web and places everything in a neat and tidy searchable database. Need something that looks like wood? Bam! It’s yours, along with no less than 10 different free options to choose from. All with one click! This site is also updated regularly, so there’s always something new when you’re scouting for the perfect lettering. Veer: With occasional free downloads (available with registration) this is the go to spot to test drive fonts before you buy. I find this especially useful if you’re looking to create or update your brand with a word mark (as discussed in the names and tagline section of part two). The built-in font preview tool lets you type in any text and then generates what it will look like instantly. No guesswork here, you will know if this font was made for you and your brand well before any financial commitment is needed…or before any sweaty palms develop while hovering over that “$29 buy it now” button. Risk free! So there you have it. 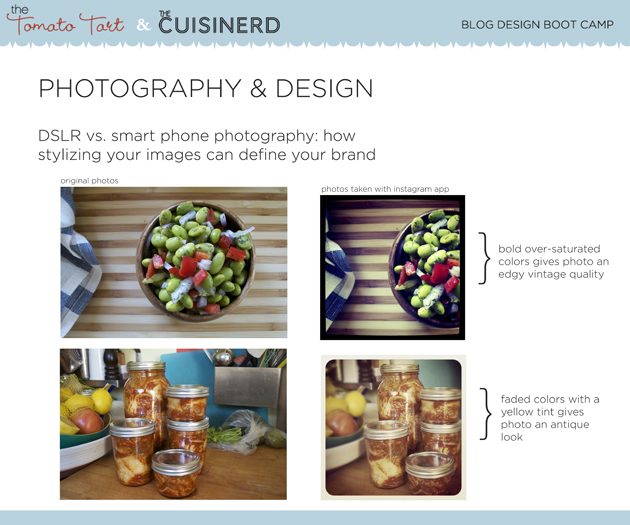 Just a little fuel for thought on additional ways to spiffy up your blog, your individual posts and your overall brand. The internet is your friend, get out there and dive into these resources and spend a little extra TLC on your website. It will be an incredible boost to your brand’s image and give you a sharper presence on the interwebz. Are you feeling inspired? We want to hear if you’ve started to implement any of the tools and tips from the four part series! We also want to see your redesigns, your new logos or wordmarks or anything else that you’ve decided to spruce up! Leave us questions and comments below or feel free to contact us via email. You can also keep the conversation moving online by using the Twitter hash tag #FBZDesign to discuss these topics with others. The Tomato Tart and I had a blast at The Foodbuzz Festival this year and we’re so thankful for all those bloggers who were able to join our breakout session as well as all of you who have joined us digitally with this online recap! Much love, hugs and remember…YOU ARE YOUR BRAND! So stay true to yourself, your objectives and get out there already! Can’t wait to see what you come up with. Cheers! 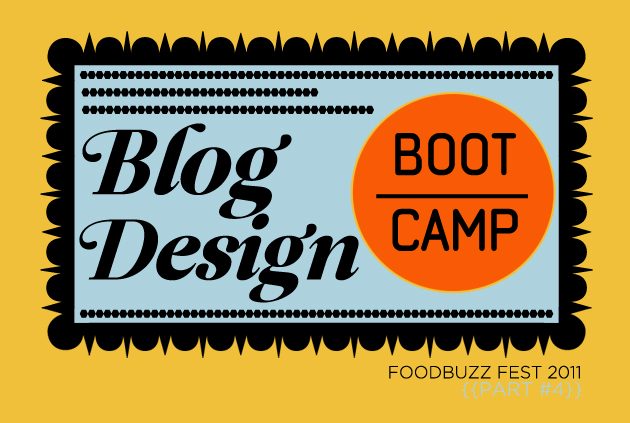 Previous postBranding & Design for Bloggers (part 3) Foodbuzz Design Bootcamp Next postPersimmon Sushi? No, But...Well, Yes. Wow! These are great tips! I will give it a try! I bookmarked this post to refer to – GREAT advice. Now to find the time/patience to implement. Since FoodBuzz I have been using the Camera + app for pics, which I really like. I already used Hipstamatic and I need to actually USE the Instrgram app I downloaded. Do you have any advice for how to make photo “collages” (group a few together) without access to Photoshop? I’m working off a Mac and don’t have anything other than iPhoto. Thanks! I hope these are three helpful options for any of you pc or Mac peeps without photoshop. Never feel limited by the tools you have, there’s always a creative solution to get you over that hump and heck, might even give you a unique look that no one else will achieve! Good luck, start experimenting and I want to hear how it goes!! I cannot thank you enough for this – I started blogging a couple of months ago totally clueless about design and how to get things looking as pretty as I wanted them. I have been blindly trying to teach myself, but this is just what I needed. Thank you!! Great final part of the seminar…love it, love it..especially since I am in South Africa where everything is a little slower and harder to find!